Explanation: Rhea is the second largest moon of Saturn, behind Titan, and the largest without an atmosphere. It is composed mostly of water ice, but has a small rocky core. Rhea's rotation and orbit are locked together (just like Earth's Moon) so that one side always faces Saturn. A consequence of this is that one side always leads the other. 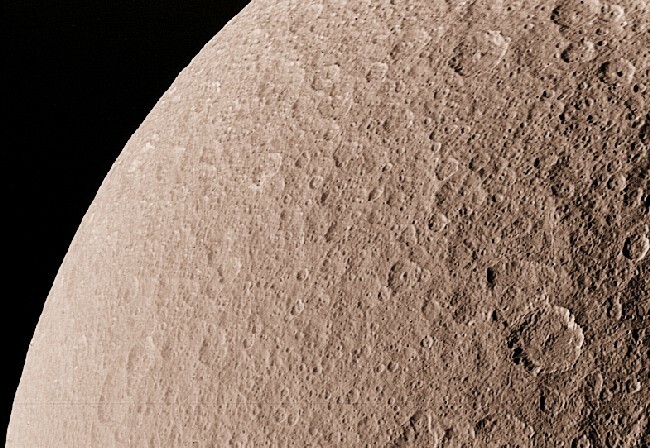 Rhea's leading surface is much more heavily cratered than its trailing surface. The above photograph was taken with the Voyager 1 spacecraft in 1980. NASA's Cassini spacecraft is currently on route to Saturn and will arrive in 2004.